Myocardial Infarction Treatment surgeries are done to address the root cause of blockage of one of the coronary arteries, remove blockage of arteries, and others. They are part of the minimal invasive surgeries for restoring the flow of blood to the other part of the arteries where the blood clot prevented the flow of oxygenated blood. Globally, increasing incidence of coronary artery disease and changes in lifestyle, increasing number of smokers, increasing incidence of obesity and lack of exercise are the prime growth drivers of global Myocardial Infarction Treatment market. In addition, increase in adoption of Myocardial Infarction Treatment in emerging economies such as China, India and others, will create new opportunities for global Myocardial Infarction Treatment market. However, higher cost of the research and development, and limited R&D Activities are the key restraints for global Myocardial Infarction Treatment market. Geographically North America dominated global Myocardial Infarction Treatment market, owing to expanding aging population and prevalence of co-morbidities. European is projected to have fastest growth, owing to rapidly increasing healthcare expenditure, modernization of healthcare infrastructure. Growing medical tourism industry in developing nations such as Japan, and India in this Asia Pacific is also driving the market in the region. Among all the distribution channel, hospitals has the highest market share in global Myocardial Infarction Treatment market. This report identifies the global Myocardial Infarction Treatment market size in for the year 2014-2016, and forecast of the same for year 2021. 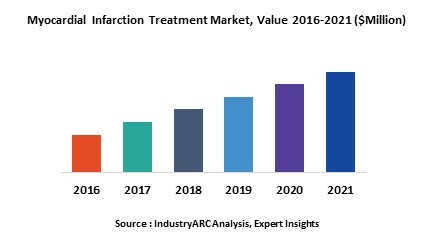 It also highlights the market drivers, restraints, growth indicators, challenges, and other key aspects with respect to global Myocardial Infarction Treatment market. AstraZeneca Terumo Interventional Systems Inc.